New Yorkers were out in their best zombie Mets uniforms, Swedish Chef costumes, and Pizza Rat outfits last night all across NYC, with the Halloween Parade alone a cornucopia of audacious and colorful get-ups. But there was no question what the best costume in NYC was last night, and you couldn't see it anywhere in the West Village—because that person was too busy spinning in place at Astor Place. Astor Place Cube Man is the costume New York City needed this year—it's been nearly a year since the Astor Place Cube (a.k.a. the Alamo) was removed off-site "for restoration and repainting and out of harm's way while the area around it undergoes reconstruction." This isn't the first time the Cube has been removed for maintenance, but we've sorely missed this East Village landmark. 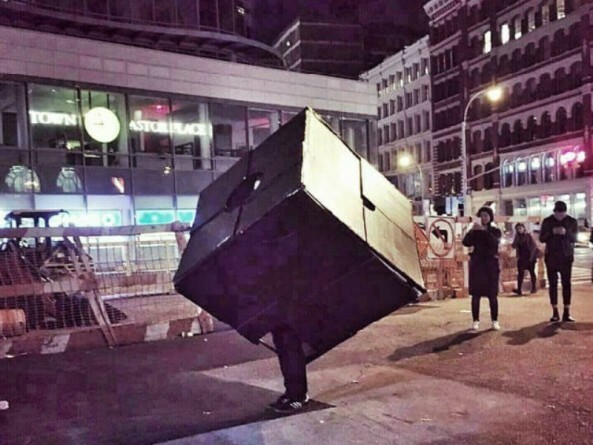 And we commend Astor Place Cube Man for bringing it back, even if it was only for one night—his commitment to spinning in place and posing for photos (one Redditor saw him there as early as 3 p.m.) is truly inspirational.